This is a post I’ve been meaning to do for a while, about the way advertising in newspapers is changing. It’s no secret the industry is dependent on adverts. Newspapers especially rely on advertising for most of their revenue, and so have to bow to the pressures of the ad men. This has become even more apparent in the last few years, as papers lose more and more money. However, something amazing happened recently which really showed how much things have changed. At least I think it was amazing. 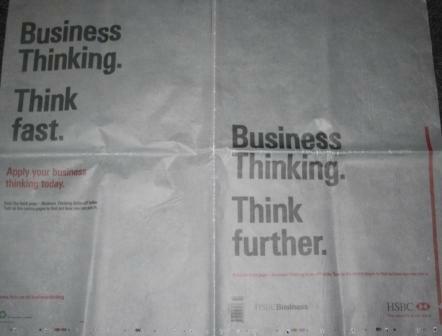 The Daily Telegraph, the only British paper which has maintained a traditional broadsheet style, came with a cover advert. That’s right, a cover advert. Simply because it shows now how much control advertisers have over newspapers. Clearly to carry out such a huge campaign (it was for HSBC) still would have cost an astronomical amount of money. But a few years ago this would have been unimaginable. Now, it’s a reality. This brings with it good and bad news. The good news is that it clearly means advertisers are still willing to pay for newspaper ads, and see them as the main way to get their message across, so at least they won’t neglect the industry. The bad news is, as papers have to make more and more money from advertisers and squeeze out every last penny, they will have bow down to pressures a lot more and resort to things like cover ads. This is the kind of thing which could eventually destroy a newspapers reputable image. 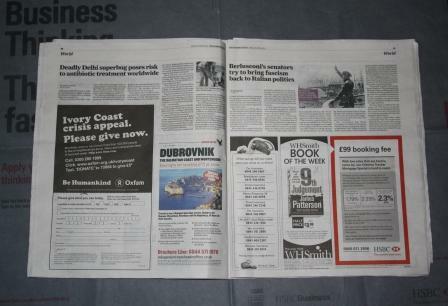 Just look at last Friday’s Independent for another example. Spread across pages 30 and 31 were no less than five ads. Five. That’s an incredible thing to see, especially over just two pages. Newspapers are struggling to survive, so in the short term selling such large chunks of each paper seems like a good idea. But if this trend continues and gets worse, then I fear it could eventually lead to our most respected publications becoming nothing but colourful picture books. Is Red Bull’s Sebastian Vettel the next Michael Schumacher? For the good of the sport, let’s hope not!